-Alabama remained No. 1 after its victory over Tennessee in Knoxville. 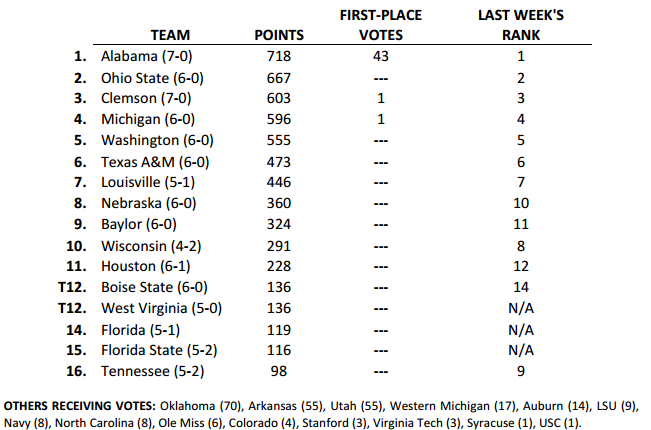 The Crimson Tide received 43 of a possible 45 first-place votes while Clemson and Michigan received the other first-place votes. The top seven teams in the poll held steady. Wisconsin and Tennessee both dropped after suffering home losses to conference rivals. Tennessee fell from ninth to 16th and Wisconsin dropped two spots to No. 10 after its overtime home loss to Ohio State. -Unbeaten West Virginia slipped into the poll for the first time this season at a tie for No. 12 as did Florida at No. 14. Florida State reappeared at No. 15. Ole Miss, Virginia Tech and Miami (Fla.) all dropped out after losses. -The Big Ten and SEC led all leagues with four teams each, but the Big Ten had four among the top 10 teams. The ACC had three, the Big 12 two, and the Pac-12, American and Mountain West had one each. Key Games in Week 8: No. 6 Texas A&M at No. 1 Alabama; No. 2 Ohio State at Penn State; Illinois at No. 4 Michigan; Oregon State at No. 5 Washington; North Carolina State at No. 7 Louisville; Purdue at No. 8 Nebraska; No. 10 Wisconsin at Iowa; No. 11 Houston at SMU; TCU at No. 12 West Virginia; BYU at No. 12 Boise State (Thursday).